Jump start your day with a fresh cup of coffee , loose leaf tea , or fruit-infused water, on-the-go! The Hastings Collective Coffee and Tea brewing accessories allows you to make make delicious beverages wherever you are. Whether at home, in transit, or at the office, this travel carafe dispenser requires no electricity or batteries. This makes it perfect for camping , road trips, picnics, or when there is a power shortage. Featuring our Thermolock Heat Retention System with double wall insulation, vacuum-sealed technology, and an inner copper coating, these drink pitchers preserve temperature and freshness for hours. Made with surgical-grade 18/8 stainless steel, these thermoses are heavy duty and rust and corrosion resistant , so they'll last you for years to come. The top comes with a leak-proof push button that seals the liquid in, guaranteeing no accidental spills and seepage when you take it to work, school, or in the car. Beautifully designed and highly-functional, the Hastings thermal carafe will be one of the most used items in your kitchen. 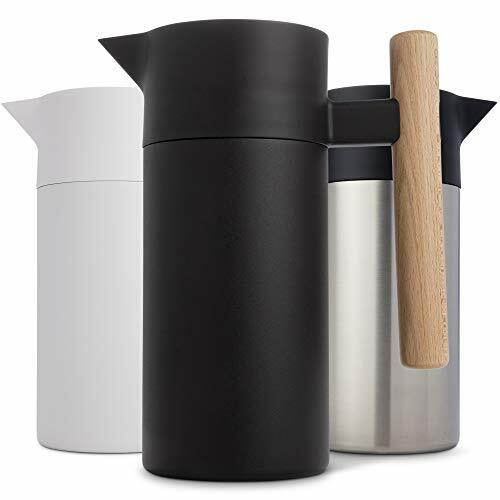 THERMOLOCK HEAT RETENTION SYSTEM - Unlike other traditional carafe thermos , ours is equipped with double wall insulation technology and inner copper coating that maximizes temperature retention. This ensures your coffee remains piping hot all morning and your iced beverages cold all day. The thermal insulated design of this coffee pitcher not only prevents heat and cold from escaping, it also helps maintain taste and freshness . BREW ON THE GO - Our coffee decanter set comes complete with a multi use, reusable filter and strainer so you can brew your favorite beverage inside the coffee vacuum pot , anywhere, anytime. The portable, easy-to-use design allows you to steep coffee grinds , loose leaf tea , or fruit. Just add the ingredients into the infusers , add hot or cold water, and voila! You can brew as you drive to work, in the office, or during travel. EXCEPTIONAL QUALITY - Each airpot is engineered with ultra durable construction , a surgical grade 18/8 stainless steel body, and a non toxic , tough PP plastic. The double-wall prevents sweating and the removable mesh filter and strainer are food-grade and BPA free. The vacuum seal push button ensures you beverage maintains its freshness and doesn't leak. Finally, this premium quality brewer is accented with a beechwood handle, adding a reliable and s mooth grip. ELEGANT , LUXURIOUS DESIGN - The Hastings tea and coffee maker boasts a simple yet handsome design , so it looks as great as it performs. Crafted with your comfort and convenience in mind, these individual-size thermal carafes are ergonomic, simple to disassemble, and easy to clean. The splinter-free wooden handle offers a smooth pour, while the sleek , modern exterior with its matte black finish complements the rest of your kitchenware . 100% SATISFACTION GUARANTEED - Hastings Collective is a family run business. We strive to develop kitchen and cookware that is equally beautiful and functional . We are proud of this line of coffee makers and want you to love your tea pot as much as we do. If you're not satisfied with this product or there is a defect, return it for a full refund or replacement.